﻿Have a question or comment for Carolyn? Enter your info & click 'send it'. ​ relishing in their art form. You can also visit Stephanie's website by clicking on her photo. 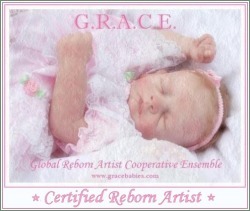 ﻿GRACE is an ensemble of reborn artists and collectors who have aligned themselves under one umbrella to preserve the masterful art of reborning. Sue & Carolyn would like to wish all of their members & supporters well in their future endeavours! ***Legal Information ~ All images, items & names on www.barefootbutterfly.com and my facebook page www.facebook.com/barefootbutterflystudio, are copyright © Carolyn (Cair) Manchulenko including but not limited to the names Barefootbutterfly © and Barefootbutterfly Studio © . I reserve the copyright on all images and ideas and characters that I create. That means that if you purchase an artwork, sculpture or doll from me, Or if I paint on your face or body or your child's face or body the artwork is indeed yours, but the idea and images are still mine to use, ie. I may use those images on my printed material, advertising, or any material I decide. I may draw images of them, write stories about them, use them on my website etc. Images of my work may NOT be used in any form of second or third party advertising or for any monetary gain for any reason. If you wish to do so, monetary compensation must be negotiated with myself, Carolyn Manchulenko, at my discretion.